Food, like fashion, is all about trends. Sometimes there are fancy cooking techniques (ie. sous vide everything! ), new cooking contraptions (ie. InstantPot! ), and a lot of the times there are cool, interesting ingredients to use. Well, not new, per se, but perhaps new applications of using an ingredient - in this case, miso. 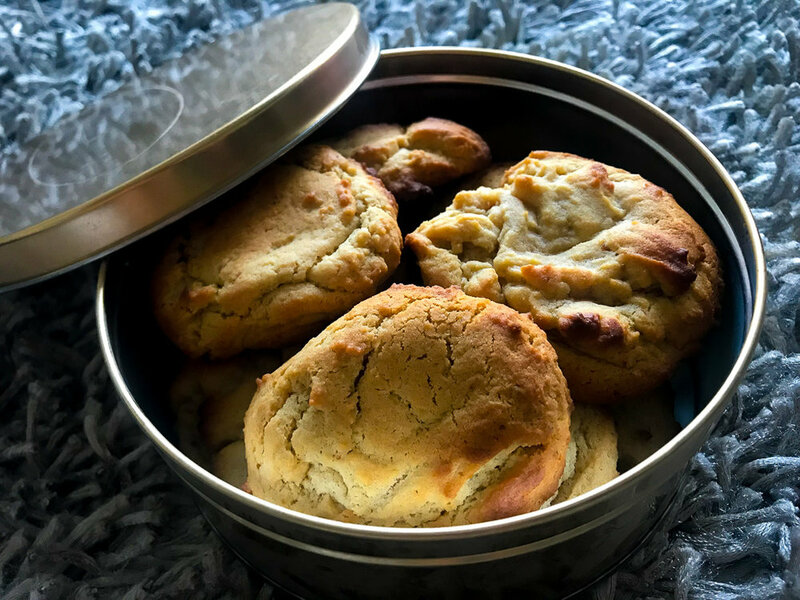 I made these miso butter cookies the other day as I had a container of aka miso at my office which was leftover from a cooking workshop that I held earlier in the year for instant (fresh) ramen bowls. Instead of letting it go to waste and tossing it to the bin, I thought of ways on how to re-purpose. I remember years ago when I had my Dolce Delights business that I had created a brown sugar cupcake with miso caramel buttercream. A lightbulb went off - maybe I'll incorporate it into some cookies?! And that's what I did. Miso imparts umami, an extra layer of flavour and savouriness to foods. Although commonly found in savoury foods, it can add a bit of creamy saltiness to a dish that is unique and builds dimension. I loved how well the miso brought out the butteriness in these cookies. It tasted like a sweeter version of a Ritz cracker. So good and a big hit at the office. This recipe is definitely going down in my regular cookie roster since I tend to always have these ingredients on-hand. Would you add miso in your cookies? Cream the butter, miso and sugars. Add the egg to the mix and beat on medium. Add the flour and baking soda. Mix on medium until well-incorporated. Cover and chill for atleast 30 minutes. Drop by the spoonful on a Silpat mat or other non-sticking surface and baking on the middle rack for 12-15 minutes.